Great article that explores the importance of supply chain optimization and the importance of using analytics to increase a company’s overall supply chain performance. Originally posted by Louis Columbus on Forbes. Improving forecast accuracy, optimizing transportation performance, improving product tracking & traceability and analyzing product returns are the use cases providing the greatest potential for analytics growth. 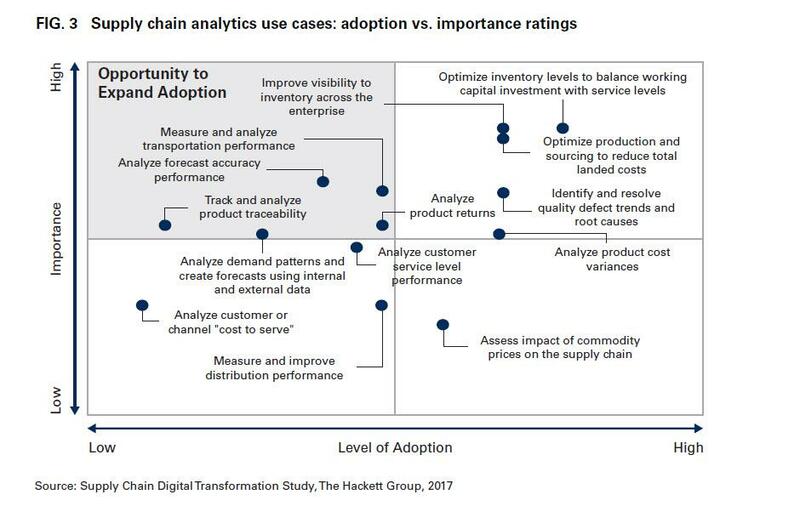 Each of these use cases and the ones that are shown in the graphic below has information and knowledge gaps advanced supply chain analytics can fill. Of these top use cases, product tracking and traceability are one of the fastest growing due to the stringent quality standards defined by the S. Food & Drug Administration in CFR 21 Sec. 820.65 for medical products manufacturers. The greater the complexity and cost of compliance with federally-mandated reporting and quality standards, the greater potential for advanced analytics to revolutionize supply chain performance. Optimizing production and sourcing to reduce total landed costs (56%) is the most important use case of advanced supply chain analytics in the next 2 to 3 years.The Hackett Group aggregated use cases across the four categories of reducing costs, improving quality, improving service and improving working capital (optimizing inventory). Respondents rank improving working capital (optimizing inventory) with the highest aggregated critical importance score of 39%, followed by reducing costs (29.5%), improving service (28.6%) and improving quality (25.75%).